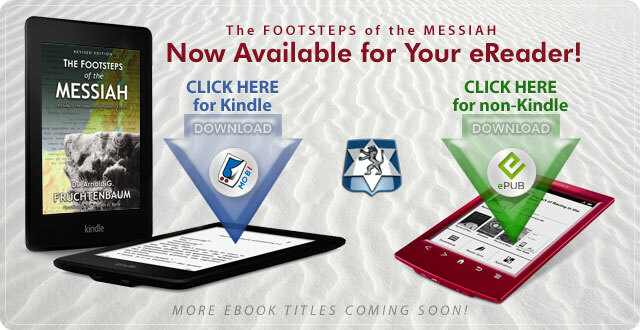 Footsteps of the Messiah, now in eBook! Get Footsteps for Kindle here, or for non-Kindle (e.g. iPad, Android) here. The Fruchtenbaum Family History Now In Print! 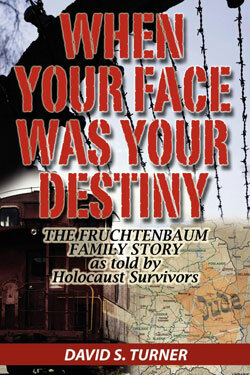 WHEN YOUR FACE WAS YOUR DESTINY: The Fruchtenbaum Family Story as told by Holocaust Survivors by David S. Turner. Order here. To read “When Your Face Was Your Destiny” is to join the harrowing journey of a family through their ordeal as Poland collapses at the start of World War II, and in a sense to experience the Holocaust personally, the way it occurred in Eastern Europe. The account has been woven together deftly by David S. Turner from the testimonies of surviving members of the extended Fruchtenbaum family. The well-honed narrative of this Holocaust story brings the reader into the lives of the Fruchtenbaum family in their hometown of Pultusk, Poland, just before the effects of World War II begin to unload like a run-away freight train. By such an excellent depicting of this close-knit, intelligent, and sensitive family during peacetime, we are quietly drawn into the picture. Then comes the unimaginable: the brutal invasion of the Nazis as the government of Poland buckles under. Each anecdote of the ever-uncertain flight from danger to safety reveals the tortuous decisions thrust on the Fruchtenbaum family during the crises. Their most disappointing shocks are the continued outpouring of hatred from fellow countrymen as well as from those along their emigration routes, and the extreme difficulty and length of time it takes to get to safety. Notable exceptions where people helped sacrificially are gratefully remembered. The five main family members telling their stories eventually reach Israel, and others in the family later immigrate to the United States. In the aftermath, they discuss with great pain the decisions they were forced to make, and the resulting losses. Their honest accounts are extremely moving. Appendices provide family photos and documentation. Undoubtedly, this book will help the reader understand the lasting scars that survivors carry, which can endure as spiritual roadblocks. Author David S. Turner survived “The Blitz” on London as a boy during the 1940s, and his family supported Jewish escapees from Nazi Germany who fled to the United Kingdom. He has lived for the last twelve years in the north of Holland, not far from the former Kamp Westerbork. The care taken to describe the relationships in the family and the dynamics that gave the family strength to endure the unbearable shows that the choice of authorship is worthy. When Your Face Was Your Destiny is one more testimony to the fact that character, ingenuity, and loving relationships make a difference even during the worst of times. David S. Turner has been married to Ina Jumelet for 54 years, and both have Huguenot ancestry. They have three grown children, eight grandchildren, and two great-grandchildren. Visit our new website and give us your feedback. 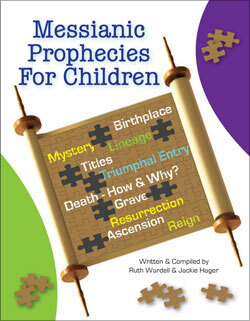 Our featured new item this week is Messianic Prophecies for Children (ages 10-13), co-written by Ruth Wardell and Jackie Hager. This teacher’s manual is a study of Old Testament/Tanak prophecies concerning the first coming of Israel’s Messiah. It beautifully reveals the redemptive plan of God and shows that the Messiah was promised as early as Genesis and that as time progressed, the revelation of Him did as well. He was to be born in Bethlehem, His mother a virgin. He would be a descendant of King David, thus part of the Tribe of Judah. His origin was “from everlasting.” He was to be a “child” given to the nation of Israel, who would someday bear the government of the world upon His shoulders. His reign would never end. In 11 memorable lessons, this unique resource involves a biblical lesson, charts, Bible drills, memorization, suggestions for craft projects, competitions, and awards. Order before January 1st and receive 30% off. Beginning November 1st we will begin a year-end sale of all Ariel books and digital media. 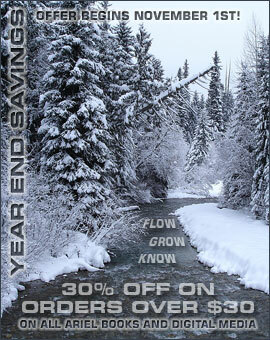 Receive a 30% discount on all orders that are $30 or more, good until Dec 31st. Also, don’t miss the “flow” of new materials we will be releasing throughout this sale. Sign up for e-mail notifications of new products here and download our free smartphone app here to receive advance notice of these exciting studies! 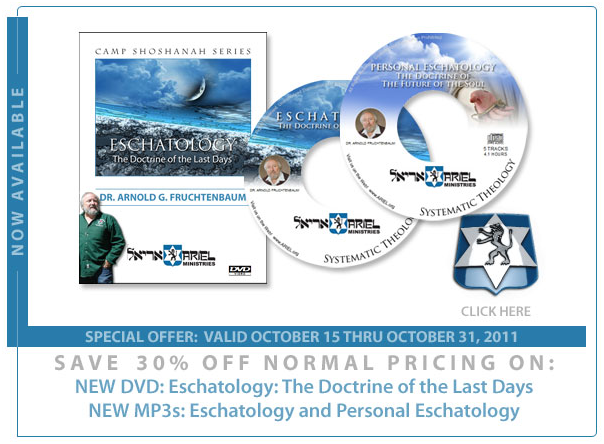 The Long Awaited Eschatology and Personal Eschatology Series by Arnold Fruchtenbaum! In light of recent attempts to cast “dates” on the return of the Messiah, these studies have never been more relevant. For those of you who have waited for Dr. Fruchtenbaum’s popular study on Eschatology, the wait is over. This DVD series contains more than twelve hours of solid Biblical teaching, recorded live during Camp Shoshanah 2010. This course cover all facets of the prophetic Word of God covering topics such as the Rapture, Israel, the Tribulation, the Second Coming, the Messianic Kingdom, the Eternal Order, among other prophetic issues. Also, don’t miss the important MP3 series on Personal Eschatology. This series probes the biblical evidence for immortality, the question of the intermediate state of the body and soul, the Old and New Testament contributions to these topics, the place of the dead (e.g., hell and heaven) and a discussion about the eternal state of believers and unbelievers.